The number of Japanese universities offering undergraduate and postgraduate courses that can be completed totally or partially in English is increasing every year. The Japan Student Services Organization (JASSO), an independent administrative institution that mainly provides scholarship and support programs for both international and domestic students, has been compiling a list of such university courses. Rather than gathering information into statistical data that can be used to compare the numbers with previous years, the sole purpose of the list is to make it easier for international students to find the best destinations for their studies. However, Itsuro Tsutsumi, the director of the Information Services Division of the Student Exchange Department, said the number of degree programs offered in English is apparently increasing, providing greater opportunities to international students. JASSO keeps track of changes in higher education institutions in Japan, accumulates data and offers useful and up-to-date information to those who are considering to studying in the country. Tsutsumi explained that the standard, and perhaps the only, way for foreign students to study at Japanese universities was to first enroll in Japanese language schools to acquire necessary language skills. International students typically spent one to two years at Japanese language schools before applying for admission to universities. However, in a rapidly changing world, spending a year or more at a language school was becoming a disadvantage. “On the other hand, whether students from abroad without any prior education in Japanese could acquire enough language skills to understand lectures and discussions at the university level within just a year or so was highly questionable,” said Tsutsumi. Therefore, university degree programs offered in English are an appealing option for non-Japanese speaking students as a fast-track solution to gain university degrees in Japan. The boost in the number of such courses has been supported by each university’s initiatives, as well as the government’s efforts, such as the Global 30 Project in 2009 and the Top Global University Project launched by the Ministry of Education, Culture, Sports, Science and Technology (MEXT) in 2014, in a bid to accelerate globalization of universities in Japan. “In addition to the degree courses, programs diverse in form and length are offered to foreign students in Japan, so there are more opportunities than ever before to find the one that best suits each student,” said Tsutsumi. This year, JASSO is hosting Study in Japan Fairs in 10 countries across Europe and the Asia-Pacific region. It also organizes annual College Guidance Fairs for International Students in Tokyo and Osaka. According to JASSO, the Tokyo-based fair boasted 184 exhibitors and Osaka had 132, both of which were held in July this year. Exhibitors at these events are mostly colleges and universities that aim to promote their courses, but some of the exhibitors represented regions. “Compared to big cities like Tokyo and Osaka, rural areas have difficulty attracting students from abroad. But many such areas are keen to accept a new population of talented students, hoping that it will solve the labor shortage in the future,” he said. That is why rural governments, universities and enterprises collaborate in exhibiting not just universities, but entire regions in such fairs to introduce attractive support packages to students. Another trend is the mobility of students. The number of Japanese university students who study abroad almost doubled during the five years between 2011 and 2016, reaching almost 100,000 in 2016 according to statistics compiled by JASSO. “Classrooms are becoming more and more international with students of various backgrounds and nationalities studying together, creating a very stimulating learning environment,” said Tsutsumi. “In addition to Japanese students, some of the international students pursuing degrees at Japanese universities also apply for short-term study abroad programs in other countries as well,” he added. The choices for students are expanding. 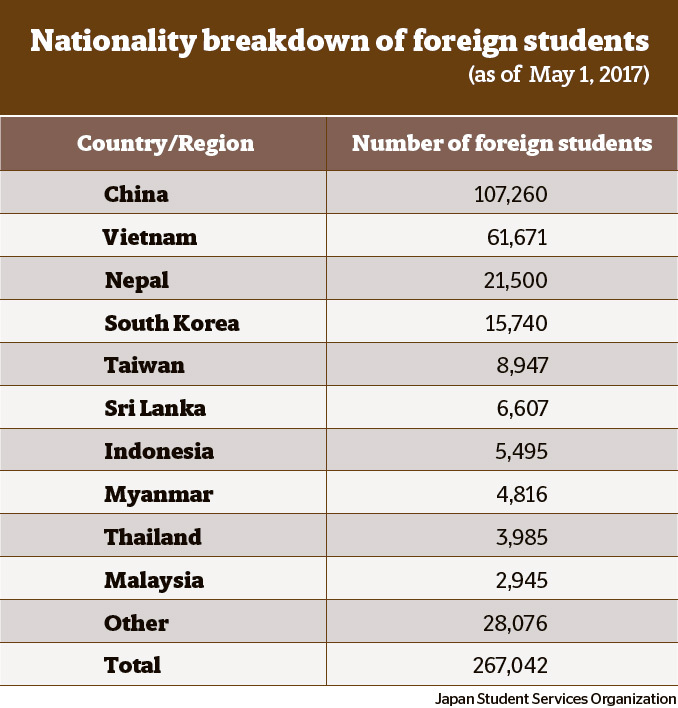 The number of foreign students studying in Japan was 267,042 in 2017, almost 2,800 more than the previous year. Tsutsumi expects that the target put forth by the government in 2008 — increasing the number of foreign students in Japan to 300,000 by 2020 — will soon be achieved. However, JASSO does not merely pursue numerical targets. “We aim to provide abundant and accurate information to those who are seeking opportunities to study in Japan. In that sense, our overseas offices in Indonesia, South Korea, Thailand, Vietnam and Malaysia play an important role,” said Tsutsumi. Additionally, the University of Tokyo, Okayama University, Hokkaido University and the University of Tsukuba, all of which are entrusted by MEXT as part of the Study in Japan Global Network Project, use their overseas offices not just to recruit international students for themselves, but also to promote studying in Japan in broader terms. Tsutsumi suggested that programs offered through exchange agreements between Japanese universities and schools from abroad are beneficial for students who are considering applying for degree programs in the future. “Most of these exchange programs are for a period no longer than one year. However, students can use the time to do some research on the universities they have been accepted to or other universities to make the right choices about the degree programs they wish to enroll in. They can also benefit from tuition waivers and credit transfers based on exchange agreements,” he explained. It may make things go smoother than applying for a degree program from scratch. On the other hand, studying in Japan is not as difficult a choice as was decades ago. In Southeast Asian countries, Australia has been a popular destination to study abroad mostly because it is geographically one of the closest English-speaking countries. However, with the increased options to earn university degrees in English combined with the familiarity bred on the reliability of Japanese brands and products, as well as the decline in living expenses, more and more foreign students are starting to consider Japan as a destination. 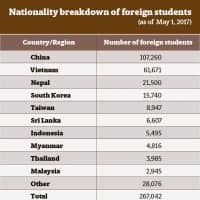 Students from China account for about 40 percent of all international students in Japan, but students from Vietnam, Nepal and Sri Lanka are increasing rapidly, according to JASSO. Japanese universities striving in the society of low birthrate and aging population see this trend as a chance too, but Tsutsumi said that making up for the decrease in the number of local students should not be the purpose of recruiting international students. “Schools that are popular among Japanese students are also popular among international students,” he said. Such universities are good at presenting the unique features and resources they have to attract a variety of students. More and more universities in Japan will make collective efforts involving communities and enterprises to promote regional appeal and job opportunities, as well as educational resources.